Batch reactors are used on a technical scale for carbon removal as sequencing foatch reactors (SBRs) with periods of filling, aerating, settling, part-emptying, filling and so on. 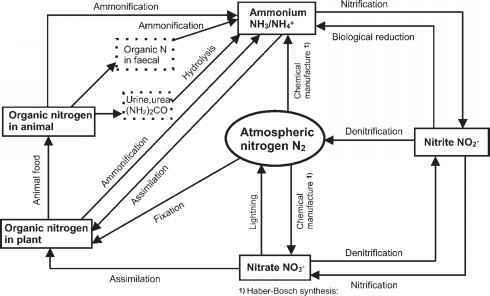 We will come back to this system when we discuss the extended process with nitrogen and phosphorus removal (see Chapter 10). For a completely mixed tank, substrate and bacterial concentrations at the effluent are nearly the same as inside the reactor. The mixed culture of bacteria always comes in contact with a low substrate concentration. The removal rate is relatively low and we do not need to consider large influences of transport processes into flocs and oxygen limitation. However, in reality, large tanks are frequently not completely mixed. The rotation speed of surface aerators is often adjusted to a needed concentration of dissolved oxygen and not to a certain degree of mixing. Nevertheless, models can help to understand the process and the behavior of the reactor much better. In PFRs, tube reactors with axial dispersion or cascades, the bacteria returned by the recycled sludge come into contact with substrate of a higher concentration, which decreases during the transport through the tank. Therefore, in the first part, the rate of oxygen consumption is relatively high, resulting in oxygen limitation, particularly inside the flocs. These effects were not described by the relative simple models discussed in Sections 6.2.2 to 6.2.6. A CSTR is generally more stable to toxic substances as shock loads than all reactors with reduced backmixing, because the toxic material is dispersed rapidly throughout the reactor and the concentration is reduced. In general, a CSTR gives a more uniform effluent for varying loads, but the reactor volume must be larger, because of the lower substrate concentration and the lower carbon removal rate throughout. In axial flow reactors, aeration of the water increases the axial mixing. For a locally constant distribution of aerators (porous ceramic or membrane tubes), the dispersion model may be used successfully. However, to save energy the distribution of aerators should depend on the task: with higher density in the first part at the higher substrate concentration which goes down to a lower density at the end where the concentration and oxygen uptake rate are lower. The model for tanks in series can be here used with more success because of the possibility to change the size of the stages and aeration rates.